Forces loyal to the Syrian government have retaken major rebel strongholds, as well as large swaths of territory in the country’s south in recent months. Eastern Ghouta: An area east of the capital Damascus was the focus of a fierce offensive by President Bashar al-Assad’s forces in April, resulting in more than 1,000 deaths, including those of 215 children and 145 women. On April 12, the rebel-held enclave was taken in its entirety by the Syrian army and Russian military police patrols after all opposition groups agreed to evacuate. In northern Syria, Turkish troops and allied Syrian rebels have been deployed to Afrin, a Kurdish enclave, to confront a US-backed Kurdish armed group. The allied forces have now taken the main city of Afrin. 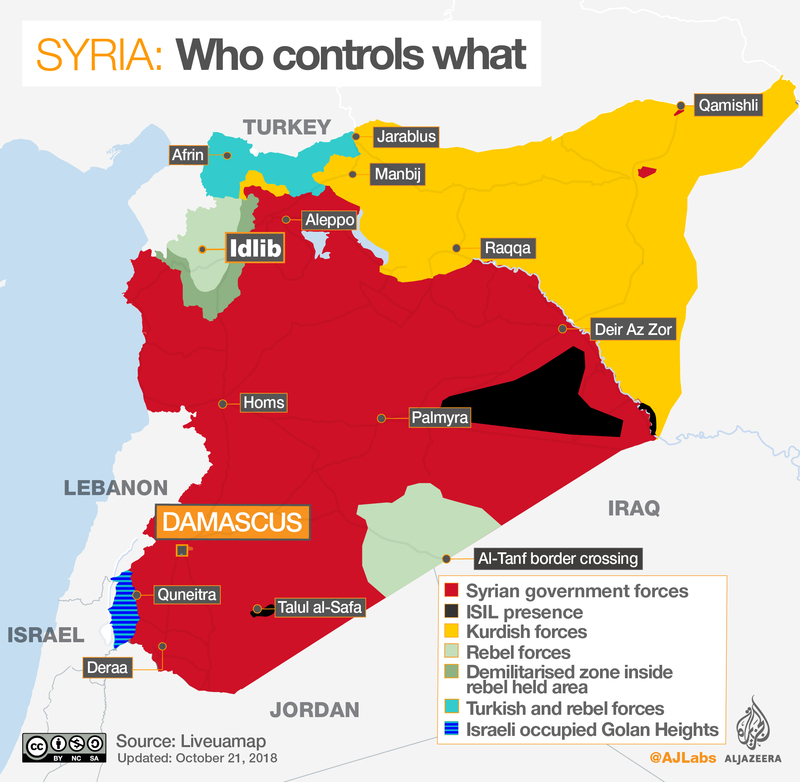 Deraa: The Syrian government and its main ally Russia stepped up their offensive and defeated rebels who controlled territory in southwest Syria, capturing a string of villages that straddle the southern provinces of Deraa and Quneitra as they edge closer to a 1974 demilitarised zone with Israel. The city of Deraa was the cradle of the uprising against al-Assad over seven years ago. A government offensive at the end of July in southwest Syria took much of the eastern part of Deraa province from rebels after a bombardment that the United Nations said pushed 160,000 people from their homes. 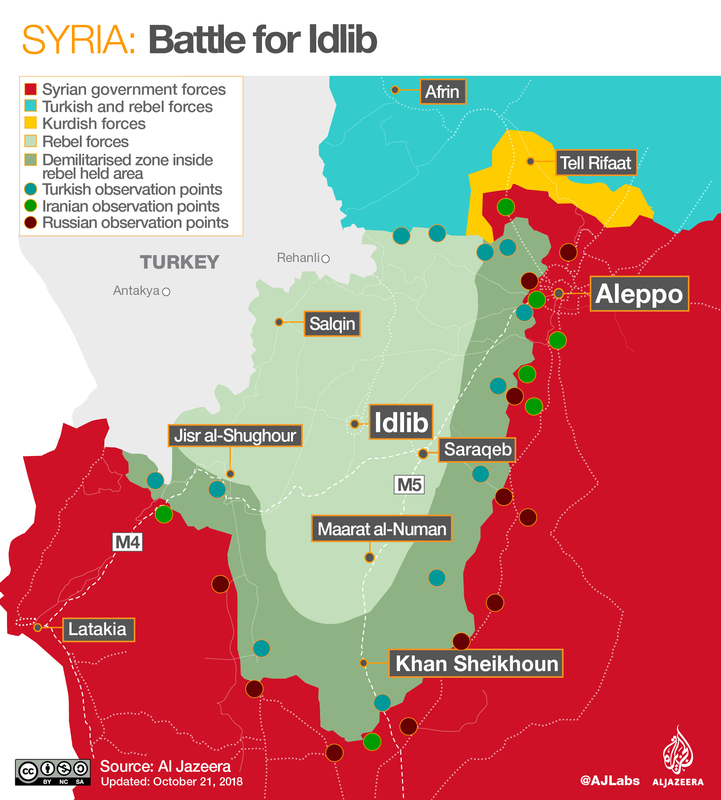 Idlib: As Syrian government forces complete their offensive in southwestern Syria, attention has shifted to the northwest province of Idlib, the last remaining rebel stronghold. Air raids have pounded areas in Syria’s last rebel-held province of Idlib, killing several civilians and raising further concerns that an all-out government offensive is only a matter of time. A full-scale military offensive would be devastating for the nearly three million people living in the province, including many rebels and civilians who were bussed out of other areas as they came back under government control. At least 24 raids – the first in three weeks – hit the area on Tuesday morning. There are an estimated 70,000 rebel fighters in and around the province. Idlib is strategically important as on one side it shares a border with the province of Latakia, home to the biggest Russian airbase in Syria, and on the other side, it borders Turkey. The strategic M5 highway – the main access road to the north – also passes through Idlib. Other groups fighting in Syria include Jabhat Fateh al-Sham, Iran-backed Hezbollah and the Syrian Democratic Forces (SDF) dominated by the Kurdish People’s Protection Units (YPG).